Following the Montreal Protocol in the late 1980s, CFC (chlorofluorocarbon) were replaced by hydrofluorocarbons (HFC) as a refrigerant. Unfortunately, the HFC’s have a global warming potential (GWP) far greater than the well-known greenhouse gas (GHG), carbon dioxide. Apart from the fact that this was not known until the mid-1990’s, climate-change due to GHG was not an emergency back then. Rapid and urgent actions had to be undertaken in order to decrease the risk of temperature rise due to GHG. The COP21 held in Paris last year and the ratification by a majority of countries (and GHG emitters) has been followed by a landmark deal to eliminate HFC’s. It was concluded mid-October in Kigali where 197 states were meeting on the occasion of the 28th Montreal Protocol meeting. But, why do GHG emissions matters, anyway? GHG warm the Earth by absorbing energy and by reducing the amount that escapes in space. This is more commonly known as the greenhouse effect. Due to the naturally present GHGs, the Earth’s air temperature is on average around 15°C. However, the burning of fossil fuels as well as the emission of other GHG’s from human activities are increasing this effect and causing a significant increase in the temperature (see Figure 1). 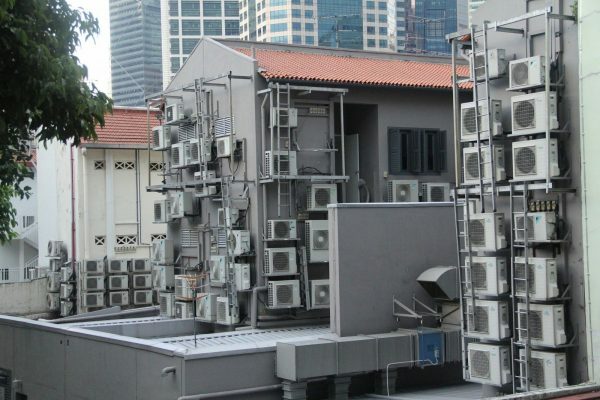 Going back to the HFC’s, scientists have argued that with the current rate of installation of air conditioning systems, there will be an overall 1.6 Billion units installed by 2050. With their booming economy, developing countries, like China or India, have experienced in the recent years a dramatic increase in such installation. The deal that has been struck last week will have developed countries gradually decrease their HFC emissions as from 2019 while developing countries will start to decrease their emissions by 2024 (2028 for others). It has been argued that these emissions would have been responsible of 0.5°C rise air temperature by the end of 2100 (Xu et al., 2013). This is a significant contribution to the 1.5°C target set by the COP21. A conversation with Didier Hauglustaine from the LSCE, France, however, highlighted the fact that there is no ideal replacement. One of the most promising one is the HFO. It looks like a variety of solutions will have to be developed depending on their usage. Giving some time to companies and states to adapt and develop new technologies that could replace HFC is hence a necessity. All of this finally raises the question of the impact of man and new technologies on the atmosphere. It seems that we have created yet another problem while trying to resorb the ozone hole with the replacement of CFC by HFC’s. More importantly, the increase in air temperature, rapid urbanization as well as the higher probability of heat waves in the future, calls for an increased understanding of the urban environment. Human comfort (indoor and outdoor) in these areas should be assessed carefully at the design stage in order to develop new urban paradigms that could limit the use of air conditioning units.